Posted on July 22, 2016 | Comments Off on How Can Yoga Help You? Those of us have seen photos of yogis performing the ultimate in yoga poses may be intimidated to try a class. Many may be interested in yoga but think of themselves as unable to do the poses for a variety of reasons. The truth is, you don’t have to be an expert, young, physically fit, or an ideal weight to experience the many mental, physical and relaxation benefits of a regular yoga practice. All yoga poses are adaptable to different skill levels and a good instructor will know how to use the right props that enable you to get the most benefit out of each pose. Unlike a ballet studio, a typical yoga studio will not have mirrors, as the class is not about comparing yourself to others or being part of a troupe. It’s about improving your own flexibility, strength and balance, reducing stress and centering on your own mindfulness, health and wellbeing. The idea is to explore your own limits to challenge yourself physically without feeling overwhelmed. Poses are intended to align your body and the practice helps you to get in touch with your inner self. If the idea of a class is too overwhelming, there are numerous tools available that make it easy to practice in the comfort of your own home. It’s okay to start slowly, as adding just a few simple poses to your daily routine can provide some health boosting benefits. While there are many branches of yoga, most sessions typically include breathing exercises (pranayamas), getting into and holding poses (asanas), and finishing with a restful meditation period (savasana). Whatever type you choose should provide relaxation benefits without causing stress or pain. For sure, yoga is not like running on the treadmill or lifting weights at the gym. Yoga is mind/body exercise that can help with reducing anxiety, insomnia and chronic pain, while providing a respite from our everyday overly busy lives. Yoga has been practiced for 5,000 years, and is widely accepted as a safe and effective alternative therapeutic exercise. It may only take a few months before you begin to see the benefits of daily practice. Regular practice will indeed strengthen and lengthen the muscles, lower heart rate and blood pressure, increase endurance and improve the quality of life for everyone. Yoga has been shown to have a positive impact on those suffering with depression, chronic illness, arthritis or back pain. Positive body image – Because yoga promotes an inner awareness rather than outward appearance, those who practice yoga regularly are found to be more satisfied with and are less critical of their bodies. Yoga has become part of the treatment for eating disorders and programs that are designed to promote self-esteem and positive body image. Back Pain – Numerous studies have found that yoga is often effective in reducing chronic back pain, improving back function and creating greater spinal flexibility. Many yoga postures strengthen the back and the abdominal muscles, essential components of the muscular network of the spine. Conditioning these muscles can help to greatly reduce back pain. The stretching and relaxation techniques promote flexibility in muscles and joints, increasing blood flow and allowing nutrients to flow into the area, while letting toxins flow out. Anxiety and Depression – Studies have shown that healthy people who practice yoga can achieve a more positive outlook on life and develop coping skills. While other physical activities play a role in physical and psychological health, stretching, balancing and strengthening our body’s core muscles all contribute to optimal wellbeing. Researchers have found that yoga is an effective way to alleviate depression and anxiety. Anxiety disorders and depression, the most common mental illnesses in the U.S., are typically treated with pharmaceuticals which treat the symptoms but can have negative side effects. Research on yoga as a therapeutic tool shows evidence that yoga can help treat depression and anxiety though accessing the mind-body connection and changing the patterns of negative self-talk and obsessions. Cardiovascular benefits – Several studies have found that yoga has a positive effect on blood pressure for people who have hypertension and may also help to improve lipid profiles. Yoga’s stress relieving benefits contribute to good overall and cardiac health, and may offer tremendous benefits in the management of acute emotional distress after a cardiac incident. The breathing exercises are also thought to improve cardio-respiratory fitness. The American Heart Association recommends continued yoga practice as a preventative measure for long term heart health, and for recovery from cardiac arrest. Weight loss and maintenance – Researchers have found that those who practice yoga have lower BMI’s, which may be attributed to a state of mindfulness that carries over to a more positive relationship with food and healthy eating. Those who begin at a healthy weight are more likely to maintain their weight. The surprising thing is that the poses don’t have to be difficult to aid weight management. Not surprisingly, yoga helps to reduce the stress hormone, cortisol, positively affecting belly fat. Stress management – By incorporating meditation and mindful breathing, yoga helps to improve metal wellbeing, increase calmness, relieve chronic stress, relax the mind, and improve mental clarity. According to the Indian Journal of Psychiatry, yoga has a demonstrated ability to lower cortisol levels. 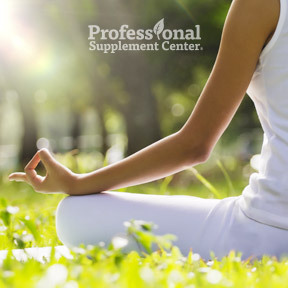 Similar to the way an adaptogen works, yoga brings the body into balance and can help to normalize cortisol levels that are either too high or too low. Yoga reduces muscle tension and relaxes the mind, helping to deactivate the stress response. This entry was posted in Home and tagged Anxiety and depression, Back pain, Cardiovascular benefits, How Can Yoga Help You?, Positive body image, Professional Supplement Center, Stress management, Vitamins and supplements, Weight loss and maintenance, www.professionalsupplementcenter.com. Bookmark the permalink.